An arteriogram is a test allows the arteries to be viewed on an x-ray . A contrast dye is injected into the arteries to make them visible. The test makes images that can be used to diagnose and treat problems in the arteries. An arteriogram is done to check the arteries for narrowing, bulging, or blockages. These could be signs of disease. Sometimes, found during the arteriogram may be treated. 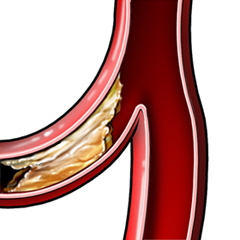 A clot may be dissolved or angioplasty with or without stenting may be done. Arrange for a ride to and from the procedure. Talk to your doctor if you take any medications, herbs, or supplements. You may need to stop taking some medications up to 1 week before the procedure. Do not eat or drink anything after midnight the night before your procedure. You will have an IV placed in your arm to give you medications. These medications will make you feel sleepy and comfortable. For this procedure, you will have a catheter placed in your groin or elbow so that the contrast dye can be injected. The skin where the catheter will be placed will be cleaned. A tiny cut will be made. A hollow needle will be inserted into the artery. A thin wire will be placed into the artery. The catheter will be threaded over the wire, and the wire will be removed. The catheter will be used to inject a contrast dye into your artery. The dye may cause you to feel warm or flushed for a few moments. X-rays will be taken to see how the contrast dye is moving through your arteries. You will need to lie still to prevent blurry images. After the test, the catheter will be removed. The IV will also be removed from your arm. You will need to be monitored for about 6 hours. Pressure may be applied to the insertion site for 10-20 minutes to stop the bleeding. You will need to keep the arm or leg where the catheter was inserted straight. This will minimize bleeding. You will be encouraged to drink a lot of fluids to flush the contrast material from your system. When you return home, be sure to follow all of your doctor's instructions. If you think you have an emergency, call for emergency medical services right away. Angiogram. Society for Vascular Surgery website. Available at: https://vascular.org/patient-resources/vascular-tests/angiogram. Accessed March 1, 2018. MR angiography (MRA). Radiology Info—Radiological Society of North America website. Available at: https://www.radiologyinfo.org/en/info.cfm?pg=angiomr. Updated April 1, 2017. Accessed March 1, 2018. Stroke diagnosis. American Stroke Association website. Available at: http://www.strokeassociation.org/STROKEORG/AboutStroke/Diagnosis/Stroke-Diagnosis%5FUCM%5F310890%5FArticle.jsp#.WphSgmrwZQI. Updated updated 23, 2017. Accessed March 1, 2018.